West African DANCE Tomorrow, Saturday 6/23!!! Not to be missed if you love to DANCE! The Dynamic Duo of Sayon Camara live drumming to the dance teaching of Marita Kennedy-Castro! They will put the wings of an infectiously joyful drumbeat under your feet! Marita is a fluid, inspiring, exquisite dancer and loving teacher. All are welcome! Young, old, experienced, inexperienced. We are here to experience the culture and have fun! Register NOW! Contact Us Here! You’ve Been Asking to DANCE and Here’s Your Chance! Marita is a fluid, inspiring, exquisite dancer and loving teacher. All are welcome! Young, old, experienced, inexperienced. Register NOW! Call or text Lev at 802-779-4914 or contact us right here. More info here or in the poster below! Once again! 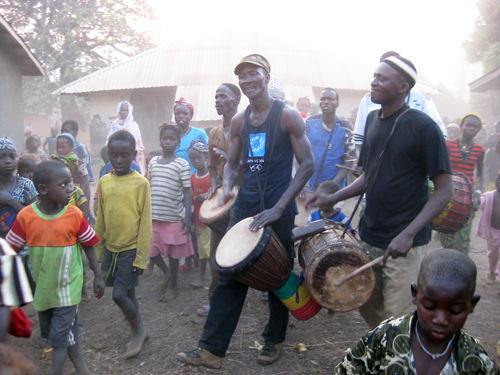 A chance to journey with Sayon in a class that engages participants in the drumming, music, song, story, traditional language and dance from Sayon’s village of Kouya Sidia. All ages and experience levels welcome! 2 More Days! 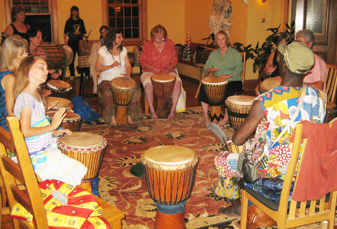 Until Sayon’s West African Drum Class in White River! All ages 8+ and all skill levels from newbie to advanced welcome. You don’t need to pre-register but it you need a drum to play for the class, please contact Sayon by Saturday at 12n to let us know. Details on the Workshops page! Journey with Sayon in a first time class that engages participants in the drumming, music, song, story, traditional language and dance from Sayon’s village of Kouya Sidia. Sayon playing in his village for the children. On My Way to Albany NY to Drum with You this Weekend! That’s THIS Saturday and Sunday, December 13 and 14. Check out the details of the workshop here. We’ll see you there! Two workshops take place in Bath Maine this weekend! An all levels workshop on Friday and Saturday, October 17 & 18 and an advanced level workshop on Sunday, October 19. The drumming is always hot at this location and this will not be the last time Sayon does a workshop in Maine but it will be the closing workshop at this beautiful location! Be sure to drum with Sayon there. Registration and information here. that’s in less than three hours… and there’s a great Arts Fest going on there all day Saturday and Sunday! 4 Days Remain! 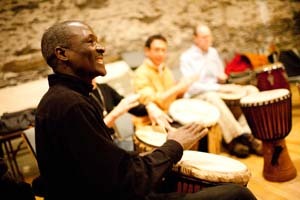 Until the July 11/12 Drumming Workshop with Sayon in VT! That’s right. The workshop starts this Friday night. There is still time to get a discount before the door price kicks in. We already have a lively and talented group who are committed. This will be a spirited workshop and a great opportunity to study with Sayon on his home turf and play with both experienced and beginning students! Expect to elevate your drumming! Details here. Today is June 30! Last Day for Early Bird Pricing on Sayon’s July 11 & 12 Workshop! Be sure to get your tickets early to this sell out event. Always a high energy evening at one of our favorite venues! Another fabulous opportunity for a Saturday class with Sayon! Saturday May 3. Coming right up in six days! This is a make up class so if you are a regular student you have already paid! Saturday drumming has great energy. We had a blast last time. Come and drum joyfully with us! See the Calendar or Performance page for details. Sayon playing in Kouya Sidia for the children. Don’t miss these 3 workshops. Getting Sayon’s fresh from the African continent energy is a real treat! Check out the Workshops Page for details on all 3 workshops. Gather up your drumming spirit and give this a try or hone your existing skills. Detailed information can be found on the Workshops Page by clicking this link.